Stuart Gordon has basically made a career out of adapting H.P. 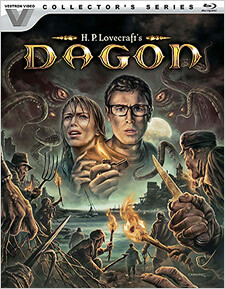 Lovecraft’s work, and nowhere is his love for it more prevalent than in Dagon. Based upon the short story “The Shadow Over Innsmouth”, it’s arguably one of the finest Lovecraft adaptations. After having recurring nightmares about a beautiful but deadly mermaid, a successful young businessman and his girlfriend find themselves marooned off the shores of Spain during a torrential downpour of rain. They go to the nearby village of Imboca for help are immediately separated from each other, subsequently hunted by fish-like people who are armed with claws and rows of sharp teeth. Their survival depends solely on them finding each other again and making their escape, but revelations about the young man’s past, including his connection to the village is, have yet to be uncovered. Dagon is an unusual film, to say the least. While it has horror elements, it’s not really a horror film per se. It’s more of a dark fairy tale, which sounds pretentious, but anyone who’s seen it would have to agree. Blood is occasionally spilled, including one scene that’s fairly horrifying, more so because of who it occurs to rather than the act itself; but for the most part, it’s an oddly compelling journey of discovery rather than an exercise in violence. It also doesn’t seem to have that satirical edge that many of Stuart Gordon’s films tend to have. The overcast environment wherein it’s constantly raining at all times gives the film a viscerally dark and gloomy atmosphere, not to mention that the characters are soaking wet at any given moment. The biggest drawback to the film is its use of CGI. It’s used judiciously, but it just doesn’t hold up over time at all. Obviously it was something that couldn’t be helped due to the low budget, but it looks worse the clearer that you can see it. What does manage to hold up are all of the amazing practical and creature effects, which even outside of the other elements, are worth the price of admission alone. It’s also shot fairly competently, outside of a few shaky cam bits that were, thankfully, few and far between. The performances are, well, not all good, and the movie definitely takes a while to get going, but once it does, it’s quite engaging and enjoyable. Vestron Video’s U.S. Blu-ray debut of Dagon features a presentation that’s sort of a mixed bag. I haven’t seen Umbrella Entertainment’s Blu-ray release of the film as of this writing, so I can’t compare the two just yet, but this video presentation has plenty of good and not-so-good qualities. DNR appears to be evident, but it’s more pronounced in certain shots than in others. Most of the footage of Paul running from the villagers, especially in close-ups, looks a bit too smooth. There’s also some apparent black crush, meaning that shadow details aren’t as good as they could be. That doesn’t mean this presentation has no merit at all, however. Despite the film having a heavy blue/green appearance, the color palette has some surprisingly good hues. Blood has a nice deep crimson hue to it, and some of the interiors, particularly during the sacrificing scene towards the end of the film, have a nice variety of colors. While detail may be lacking, there’s still plenty to be had, especially on Paul’s rain-soaked glasses, as well as the details on the creatures themselves. Brightness and contrast levels are never really a problem, and the overall image is stable throughout aside from the opening credits. For the audio, an English 5.1 DTS-HD track is included with optional subtitles in English SDH. It’s a decent audio mix for a low budget film of its type. Dialogue is always clear and discernable, even during the steady rainfall, which thankfully doesn’t dominate the soundtrack. Sound effects and score have plenty of room to breathe and fill up the rear speakers nicely. There isn’t much in the way of speaker to speaker activity, but ambient sounds and low end moments come through often. As with all of Vestron Video’s releases, there’s a mix of vintage and new material from Red Shirt Pictures. There’s an audio commentary with director Stuart Gordon and screenwriter Dennis Paoli; another audio commentary with director Stuart Gordon and actor Ezra Godden; Gods & Monsters, a 22-minute discussion between Stuart Gordon and filmmaker Mick Garris about the making of the film; Shadows Over Imboca, a 20-minute interview with producer Brian Yuzna about how the film got made in Spain; Fish Stories, an 18-minute interview with S.T. Joshi, author of “I Am Providence: The Life and Times of H.P. Lovecraft”, who covers the original short story and Lovecraft’s obsession with the sea; 22 minutes of archival interviews with Stuart Gordon, producer Julio Fernández, actors Raquel Meroño, Ezra Godden, and Francisco “Paco” Rabal, as well a minor bit of B-roll footage; a vintage 28-minute EPK featurette, which is basically round-table interviews with Stuart Gordon and actors Ezra Godden, Macarena Gómez, and Raquel Meroño; an animated conceptual art gallery by artist Richard Raaphorst; an animated storyboard gallery; an animated still gallery featuring on-set photography, behind the scenes photos, and promotional materials; and the film’s theatrical trailer. With a Wicker Man sensibility to it, Dagon is a surprisingly satisfying film from an era when horror films weren’t at their most creative. It took Stuart Gordon and producer Brian Yuzna almost fifteen years to actually get it into production as they wanted to make it immediately after the success of Re-Animator, but thankfully, it came to be, and we have one more Stuart Gordon film as a result (which is never a bad thing). Vestron Video’s release of the film isn’t perfect, but with this amount of extras and the beautiful cover artwork, how can you complain? Highly recommended!